We went to the park today. 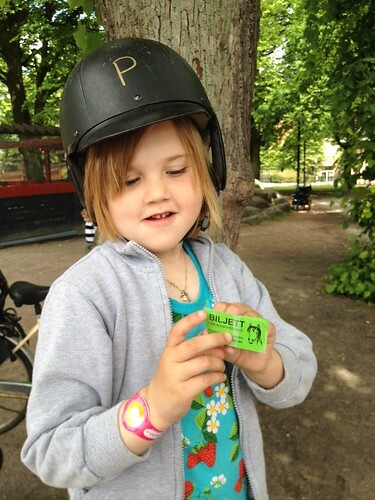 Sofia had asked to go on a ride and while we waited for the Tivoli to open she went to the little zoo, had an ice cream and went on a pony ride. It feels so weird to only have one child to look after. We're all missing Isabel like crazy and while I think Sofia enjoys the attention of being an only child she still misses her big sister. We're driving to the camp tomorrow to visit Isabel. They're having an open house. It's going to be fun to see her and to see where she's staying. I work again next week where as Rickard's on his summer vacation. His mother is taking him and Sofia for a drive to visit their new puppy. Puppy is only 6/7 weeks old and won't come to live with them until mid July but they go up to visit fairly often. Today I also finally laid my grubby hands on this parcel of goodness. 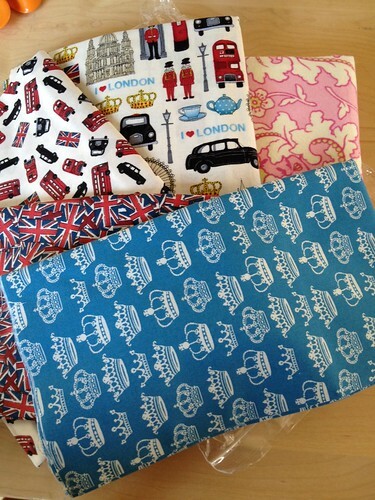 Some London novelty fabric for bags and totes and 2 yards of lovely flannel for pjs, nightgowns or blankets - I haven't decided yet. I got the slip in the mail on Wednesday but when I drove over they said the parcel hadn't arrived yet. Neither had it on Thursday, but when I called the Postal Services they said the store should check their shelves because it hadn't been registered anywhere else. Sadly that was the day before Midsummer's Eve and while I don't really think that's my problem I understand they had a lot to do. However when we were there today and I kindly but firmly asked them to check in the back it took the lady less than a minute to find my parcel ... I rest my case. Instead of registering the bar code from the Swedish Postal Services they registered the parcel using the bar code from the USPS - which didn't match my pick-up slip. This has happened before and I will not be so meek next time it happens. It's fabric for crying out loud!